At the heart of the Queens Pride Lions Club is giving back to the community and pitching in when there is a need. Lions Clubs International's motto is "We Serve" and every day; through our many service projects, that is exactly what we do. Although we are based in Queens, we have members throughout New York City and our service projects affect communities throughout the city. Beep Baseball is an adaptation of the all-American past-time for blind and visually impaired individuals. The Queens Pride Lions Club, helped introduce Beep Baseball to hundreds of visually impaired children in NYC. We've provided several Beep Baseball Clinics and Beep Baseball equipment for physical education teachers in NYC schools and for visually impaired children. We thank the NYC DOE District 75 and Educational Vision Services, Brooklyn Cyclones, and the Brandel Murphy Youth Foundation for their partnership in this project. The NYC area Braille Challenge started in January 2016 through a partnership between the Queens Pride Lions Club, Little Neck Douglaston Lions Club, and the NYC DOE District 75 and Educational Vision Services. This national challenge encourages visually impaired children to work on their braille proficiency by providing a contest among their peers locally and nationwide. In it's second year, the NYC area Braille Challenge doubled in size with more than 100 children participating, and the addition of informational and resource displays for parents and families. Our semi-annual environmental project has helped recycle tons (literally) of electronic waste including antiquated and broken VCR's, computers, cables, and many other electronic devices. Now in it's fifth year, this Spring/Fall event draws hundreds of Jackson Heights residents and helps protect the environment through recycling or proper disposal of electronic waste. We've also expanded the program to accept donations of clothing and old eyeglasses so that we can provide them to to those in need. We thank the Lower Eastside Ecology Center and NYC Council Member Danny Dromm for partnering with us on this great community project. Our club has been instrumental in initiating the largest expansion of Lions Quest in many years. We have facilitated Lions Quest training of nearly 200 teachers so that they to can bring the Lions Quest curriculum into their respective classrooms, reaching thousands of NYC children. Lions Quest programs are comprehensive, positive youth development and prevention curricula that unite the home, school and community to cultivate capable and healthy young people of strong character. Lions Quest K-12 programs teach essential life skills that support character development, social and emotional learning, civic values, substance and violence prevention, and service-learning. To learn more about Lions Quest in NYC visit www.lionsquestnyc.com. We organize clothing drives and collect gently used men's, women's, and children's clothing on a regular basis. The clothing are donated to the Positive Health Project and Fashion on Gender. We are proud that our clothing donation to these unique groups help out a needy population that is often overlooked during clothing drives. Through our many drives we have been able to donate hundreds of clothing items directly to those who need them. To learn about upcoming clothing drive collection dates and drop-off locations please contact us. 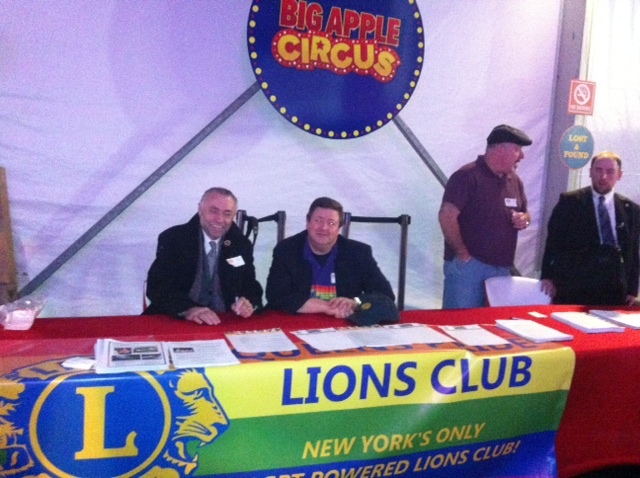 The Queens Pride Lions Club regularly partners with the legendary Big Apple Circus for "Lions Day at the Circus". Previous events have included a sponsorship of more than 100 visual and hearing impaired children with ringside tickets to the legendary Big Apple Circus at the Lincoln Center. See the article in Lions Clubs International's official blog. We also held a health fair and special circus reception for about 60 seniors at the Big Apple Circus in Cunningham Park. Many of the seniors said this was the best outing they had in years and were so thankful. _The Queens Pride Lions Club has collected and processed several thousand pairs of eyeglasses through the "Lions Recycle for Sight" program. If you wear eyeglasses then you probably have old pairs of frames and glasses lying around in your house. You can donate those glasses to us and they will be recycled at the Lions Eyeglasses Center and passed on to someone that needs glasses. >> Click here for a list of our eyeglasses drop-off locations throughout the city. When our guest speaker told us about the Victoria Congregational Church's after-school program and their dire need for supplies, our club knew we had to help out. We set up a school supplies drive and members pitched in with hundreds of items including pens, pencils, rulers, notepads, stickers, and much more. _ The Queens Pride Lions Club volunteered and participated in the HOPE Survey 2012 on Monday, January 30, 2012 at 4 locations in Queens. The HOPE (Homeless Outreach Population Estimate) Survey is conducted by the Department of Homeless Services every year to determine an estimate of the current amount of homeless individuals living in New York City. These numbers are important as they are used in public policy and funding decisions that affect all homeless individuals and families. _During the 2011 holiday season, we collected toys for children for the holidays. This was our first holiday toy drive and we collected over 150 toys that were then distributed to needy children in our neighborhood. Thanks to all of our generous members and friends for making our first toy drive so successful and the Queens Pride House for hosting our toy drop boxes.